This article is about the Futurama comic. For the character, see The Son of the Sun (character). "Son of the Sun" is the thirty-fifth comic issue, which was released January, 2008 in the US. Zoidberg auditions to become a member of the New Justice Team, but is rejected when he accidentally snaps Super King's head off. Fry shakes a screaming Bender from the flashback caused by a new memory card. Bender decides to project the memories on the wall for Fry to see. Clamps auditions too, and impresses the team with his clamps. Unfortunately, he'd intended to visit The Super Robot Injustice Society next door, and leaves. Shortly after, night turns to day as a new super villain appears, and, due to the Arnold Drake statute on superheroic battles, reveals his origins. The Son of the Sun is the child of one of the heroes' defeated nemeses. He never got along with his father, but still wants revenge; so he places five additional suns in orbit between the Earth and its moon. After Nixon holds a press conference, the team head out into an unsuccessful battle against the Son, leading to sunstroke hallucinations. After a few days the planet's water has mostly evaporated and people have had to take in homeless sea creatures. The Professor reveals a high-powered air conditioner robot for the crew to take with them to The Son of The Sun's base on the Sun, where they are easily captured despite the irony loving guards' ineptitude. Fortunately they are able to determine that their captor is afraid of the dark and convince him to confront this fear (and free them from the elaborate killing machine they are tied to). He opens a nightclub and retires from villainy. 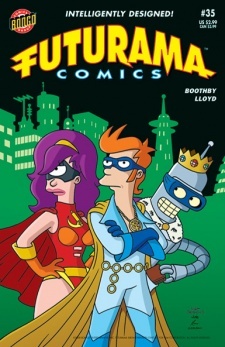 after the flashback ends, Fry and Bender decide to satisfy their superhero urges by playing a video game. This comic mostly takes place in flashbacks to previously unseen adventures of the New Justice Team. The miracle cream also causes memory loss. Additional abilities also include fighting dry skin and providing a healing factor, which can reverse being burnt to ashes. This visit to the sun is slightly more logical than the last time, inventions have been provided to keep them alive and on the surface in this comic. Bender: Please stop doing that. And let's never speak of this again. Despite being set during "Less than Hero", during which the heroes kept their identities secret from their co-workers, their identities are clearly known by the staff, especially since they appear to be using the Planet Express building as an in-costume headquarters. This page was last edited on 5 August 2013, at 13:08.